We continue our look at creating RESTful APIs with this helpful framework by developing web services and exploring how to handle JSON in our code. In the first part of this series of articles, we talked about the main features of the Play Framework, its basic structure, and how to deploy our applications. In this part, we will talk about how to develop RESTful Services. If you remember (if not, we invite you to read the first part of this series of articles) we mentioned that Play Framework is Reactive, which means that we can develop Asynchronous and Synchronous Services. For the purposes of this second article, we will focus on Synchronous Services. Let's look in more detail at the index action in HomeController. Remember that RESTful is a first-class citizen in the Play Framework, which means that all actions are RESTful Services. The structure of an action is simple, it always returns an object of type Result (play.mvc.Result). A Result is the representation of an HTTP result with a state code, headers, and a body that is sent to the client. For example, in the index action, we use the ok method to return a Result that renders HTML in the body. Instead of rendering HTML in the body, we can send plain text. For this, we will add a new action in our HomeController call it plainText. Once we have added the action, we must add this to the routes file in order to execute it. Now we can compare the differences between call the index and plain actions from Insomnia. The first difference, as you can imagine, between both is the body, since for the index we render HTML, while for plainText we just show plain text. The following difference lies in the Header Content-Type, for index return "text/html" and for plainText "text/plain." When we develop Web Services we seek to use an information exchange protocol, such as JSON. The Play Framework is based on the Jackson library for the handling JSON, using the JsonNode object \, and leaning on the play.libs.Json API. To start our journey developing RESTful Services that return JSON, we will start by importing play.libs.Json in our HomeController. As you can see, the only thing we did here was create a HashMap, to which we added two elements "str" and "int" with their respective values. Then, using the toJson method of the JSON API, we indicated that we want to return the HashMap in JSON format. To see how the consumption of this new service looks from Insomnia, we will define the call to this action in our routes file. This is an example to render a HashMap as JSON. To continue, we will do the same thing with an object. 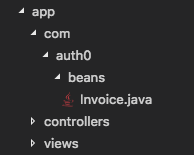 For this, we will define a class called Invoice, which will be inside the package com.auth0.beans that we will create at the same level as the controllers directory, which can be seen in the image below. Note: for readability of the article we do not include the get and set methods of the Invoice class. Invoice invoice = new Invoice("Perico de los Palotes", "City", "123456-7"
return ok(invoice.getCode() + " | " + invoice.getIdNumber() + " | "
We have seen, throughout our examples, that actions always return the Result object, which we have previously indicated is the representation of an HTTP response with a status code, headers, and a body that is sent to the client. The Controller object already has a series of methods that allows us to create Result, those methods inherit them from the Results class (play.mvc.Results). In the case of the examples that we have listed in this article, only the ok method has been used, which returns the status code 200. Addiontionally, in the body we have rendered HTML, text, and JSON. In this example, we are returning a bit of plain text in the badRequest, just like in ok. Here we can also render HTML, text, or send JSON. In order to try this new action in Insomnia, we must add it to our routes file. To further delve into the methods inherited from Results you can see the official documentation of play.mvc.Results. As we mentioned previously, in the index example, an HTML template is rendered. To adapt it to what we want, we have to make it no longer render the HTML, but, instead, render what we want. In this article, we have talked about how to develop Synchronous RESTful Services in the Play Framework by returning and obtaining JSON. You can access the source code by visiting the repository on. In the next series of these articles, we will be talking about the use of JWT for a more secure information exchange.